Is Burger King’s $5 Coffee Subscription Worth It? Growing up, my favorite fast food restaurant was Burger King. Despite the fact that there was a Wendy’s at the end of my street, I always preferred visiting “The King” and enjoying a flame-broiled burger. While I’ve cut back on fast food over the years from my youth levels, I’ll still visit fast food places several times a month. But as a McDonalds shareholder and the fact I have selected them as my restaurant category in the Bumped App, my incentive is to visit the Golden Arches. But Burger King made one heck of an announcement over the weekend. Burger King will now offer a $5 per month coffee subscription! As a coffee fanatic, I loved reading the headline and article. This announcement had me thinking…is it worth it? So I analyzed the subscription plan from the perspective of four different coffee drinkers to see: The Coffee Snob, the Daily Coffee Buyer, the Keurig Lover, and the Home Brewer. Frequency: One cup of coffee per day. The subscriber is entitled to one coffee per day of the month. If the individual does not claim their coffee for the day, the coffee is lost. You cannot roll unused days forward. For example, if you skip Monday, you cannot claim two coffees on Tuesday. In the article, I will use an overall cost per cup of coffee for Burger King assuming a 30 day month. Assuming 30 days, the cost per cup of coffee is only $.17/cup ( $5 / 30 Days – $.1667. Rounded to $.17/cup). For the fun of it, I showed the calculation for the other months. For February in a non-leap year, the cost increases to $.18/cup. For a 31 day month, the cost decreases to $.16/cup. Who is a Coffee Snob? As a former coffee snob, I would know one. The coffee snob is an individual that will only drink coffee at a locally owned coffee shop. The coffee snob is an individual that places the taste and quality of coffee above all else, regardless of cost. Cost Comparison: I’m not even going to crunch the numbers. There is a zero percent chance that a coffee snob has ever paid less than $.17 per cup of coffee. And most likely, this type of individual does not care! Is Burger King’s $5 per month subscription plan worth it for a Coffee Snob? No. For this individual, it’s not about the cost, it is about the quality. The Coffee Snob would never choose Burger King’s plan over their current coffee routine. Who is a Daily Coffee Buyer? You know the Daily Coffee buyer. The person that comes into work every morning with their Starbucks or McDonalds coffee cup. This individual does not have time to brew their coffee at home each day, or maybe they just don’t want to. Instead, they stop at a coffee chain on their way to work or their destination. 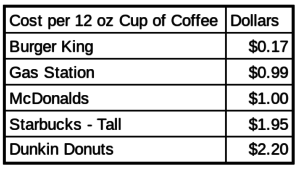 Cost Comparison: To compare the costs, I reviewed the price of a 12 ounce coffee at four locations that a Daily Coffee Buyer is likely to stop at for their coffee fix: A Gas Station, McDonalds, Starbucks, or Dunkin Donuts. In this, I did not consider brand loyalty or the difference in taste/quality of the coffee. Simply the cost. Is Burger King’s $5 per month subscription plan worth it for a Daily Coffee Buyer? Yes! When compared to each of the stores, the cost of a cup of coffee at Burger King will be cheaper than the alternatives! Who is a Keurig Lover? A Keurig lover is an individual that loves the convenience of popping a K-cup into the machine at work and drinking the single-brewed cup of coffee. Cost Comparison: On Amazon, I can purchase K-cup boxes with varying numbers of K-cups for as low as $.25 per K-Cup. To achieve this low of a price, you are required to buy a large quantity of K-cups. Is Burger King’s $5/month subscription plan worth it for a Daily Coffee Buyer? Yes. From a pure cost per cup standpoint, the $.17 per cup of coffee at Burger King is cheaper than the cost of a K-cup. Who is a Home Brewer? A Home Brewer purchases a bag of coffee from a store and brews coffee at their home. This is currently me. Every morning, I brew a pot of coffee at home, pack a mug, and get on my way. If it is the weekend, I pull out a coffee mug from the cabinet and enjoy the coffee throughout the day. Cost Comparison: Currently, I purchase a 12 ounce bag coffee at Aldi for $4.49 per bag. 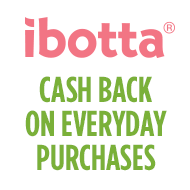 But coffee at the store can range anywhere from $3.99 per bag – $9.99 per bag (for ease of the analysis, I will not assume coupons, sales, or other cash back apps that can be used to reduce the cost of a bag of coffee). Using coffee conversion websites, a 12 ounce bag of coffee should produce 46.5 cups of coffee. Well okay, now this is getting really interesting! Looking at the table above, if you can buy a bag of coffee for less than $7.99, it is more cost beneficial to brew your coffee at home rather than subscribe to Burger King. If for some reason you are in an area where a bag of coffee is $8 or more, than it would be cheaper to purchase a Burger King subscription! But wait, there is ONE more element to consider in this analysis. Do you have to leave your house to brew your own coffee? Nope! Do you have to leave your house to purchase a cup of coffee at Burger King. Yep! So the cost per cup actually INCREASES for a person who typically brews their coffee at home because they have to use gas to get the coffee. WOAH! Now we are getting somewhere. 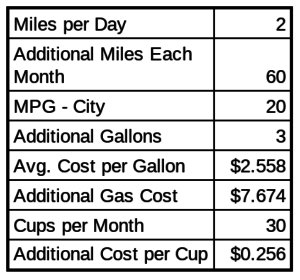 If you have to drive two miles round trip, each cup of coffee will cost an additional $.256. In total,each cup will now cost .$426! That is WAY more expensive that the calculated cost of home-brew at each price point in the first table. Obviously, if the trip to Burger King was only .5 miles or 1 mile, the cost of gas would decrease to $.064/cup or $.128/cup, respectively. But these are STILL more expensive than all the home-brew scenarios above. Is Burger King’s $5/month subscription plan worth it for a Home Brewer? This was a really fun analysis. In a vaccum, the cost of Burger King’s coffee subscription could be affordable if the cost of a 12 ounce bag is $8 more in the area you live. However, when you factor in the cost of driving to pick up the cost of coffee each day, the plan IS NOT worth it for a Home Brewer! The results of the analysis show that Burger King’s $5 coffee subscription is worth it for individuals that either use a Keurig or purchase their coffee from coffee shops like Starbucks, McDonalds, Dunkin Donuts, or the gas station each day. For someone who appreciates a quality cup of coffee and refuses to sacrifice quality or an individual that brews their coffee at home each day, the $5 subscription plan is not for you! The truth is, this is the exact target market that Burger King is looking to capture. Burger King wants the person to drive to their restaurants every day for coffee rather than their competitors. The consumer is likely going to purchase other breakfast items as well. So a $.17 per cup of coffee is worth the increased traffic and other sales. I think the promotion is a great idea to increase traffic and I’m excited to see just how much of an impact it has on consumer activity. Just hopefully it isn’t too impactful, because I own shares of both McDonalds and Starbucks! Are you subscribing to Burger Kings $5 coffee subscription? What are your thoughts about the promotion? What type of coffee drinker are you? This entry was posted in Frugal Living and tagged $5 subscription plan, burger king, Coffee, McDonalds, Starbucks. Bookmark the permalink. 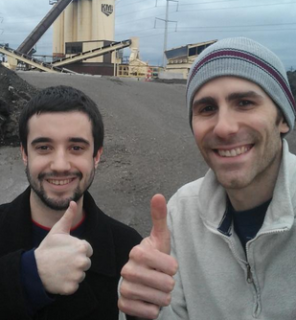 ← February Dividend Income from YOU the Bloggers! That is a funny article, one that doesn’t apply to me much. I did not start drinking coffee until maybe 2 years ago and I only did it for long car rides or really early morning site work. Now that I have a kid I drink maybe 4-5 cups a week, depending on how the kid sleeps. I never go beyond my work’s coffee machine really. Funny how kids change that profile. That was a great analysis and a great read! The $5 coffee subscription is good for pass-by-traffic. If it’s inconveniently located then people won’t bother. But $5 per month sounds like a great deal to me. I own Burger King shares through Restaurant Brand International holding company 🙂 That may help increase traffic to the store and potentially cross-sell other food. You have too much time on your hands…lol! When in doubt, crunch the numbers! Good job. I’m a home coffee brewer but I take the train to work and pass lots of purveyors of coffee (including Burger King) on my walk to and from the station at ether end. That takes the gas cost out of the mix for me. But, the big thing for me is a) taste, and b) time. On taste I can make my coffee exactly the way like it I’m not a coffee snob but I like my coffee stronger than you get in most stores. Even bigger for me is time. Brewing my own coffee is now integrated as part of my morning routine so it doesn’t feel like it adds more time for me. Having done it for years and having stopped, I think that I’d now get frustrated if I had to wait in line to buy a coffee every morning.